Larry claims to have blooming crocuses and coltfoot at his place. I've seen never up here yet, but it's not far away. Very springy up in here, tons of songbirds on the feeder and in the apple tree. Onion sets appearing in the grocery store. Time to think about the garden. 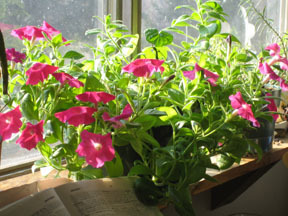 But in case you hadn't caught the more subtle harbingers of the coming season, the pot of petunias in my livingroom leaves you little room for denial. I had a gomphrena or globe amaranth in that pot last summer, kept it in the house all winter, and a few weeks ago it croked. Sad. But little yellow-green shoots were coming up through the dead stuff, so I hoped it had reseeded itself. And the shoots grew and grew until a bug appears, yeah. But the leaves were not quite the same shape as the gomphrena plant had, and the shoots were getting viney rather than growing straight up. Hmm. The first blossom was quite a surprise, wave petunia. Seeds must have volunteered from my plants last summer or the summer before. I reuse my hanging pots and much of the dirt, too. Liv and I are chatting on the way home from work last evening, and she voiced her observation that the way home is always shorter than the way to anyplace. "It's a wayback thing," she said.